Manny To The Mets? What? 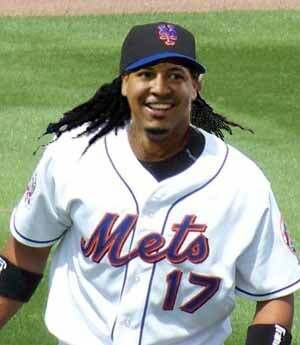 With John Maine headed for a shoulder MRI, it would seem that the Mets have bigger problems; but at any rate, Manny Ramirez seems to be back on the table. Despite Monday's denials, both the Mets and Red Sox are admitting today that they've been in touch. Suddenly Manny as a Met is a real possibility, if not now, then next season. The Red Sox suspect that GM Omar Minaya wants Ramirez more than Mets ownership does. Regardless, the Mets are reluctant to part with top-prospect talent in exchange for outfielders like Adam Dunn, Raul Ibanez and Randy Winn, but they (rightly) consider Ramirez a far superior hitter to those in that group, and they would discuss players in a Ramirez deal that they would not discuss in others. What remains to be seen is whether a Ramirez deal is too complicated to come together in time for the deadline. Meanwhile, Mets bloggers have visions of jheri curls dancing in their heads. Trade for this guy at all costs. I'd be willing to part with Jon Niese, Eddie Kunz or some package of a few top prospects for this high caliber player. He's a professional hitter, and would take over left field for the Mets, something they dearly need for the stretch. Jerry Manuel seems like the kind of guy who would be able to keep Ramirez in line, and Omar Minaya has always had a love for Manny. Could you imagine Manny in a Mets uniform? Oh man.